Playing Piano is Tons of Fun on Yamaha's Portable Grand! With Yamaha's detailed stereo grand piano sound -- plus an extensive palette of 500 more sounds, tons of on-board learning tools, and inspiring auto-accompaniment rhythms and styles -- the 88-key Yamaha YPG-535 Portable Grand keyboard makes practicing piano great fun. Packed with bells and whistles, yet incredibly easy to use, the YPG-535 has a "Portable Grand" button that takes you back to Yamaha's stereo-sampled, room-filling grand piano sound with just one touch. From there, you can easily layer sounds, split the keyboard, jam along with built-in Styles, see the chords and notes you're playing on-screen, follow Yamaha's built-in lessons, and even record yourself with the 6-track sequencer. The Graded Soft Touch keyboard is gently semi-weighted and is easy for beginners to play -- just choose one of three settings for touch-sensitivity. Best of all, this full-size, 88-key keyboard fits your home and your budget. While the YPG-535 has a ton of fantastic instrument sounds, the centerpiece of this and all Yamaha keyboards is the lush grand piano. As the maker of some of the world's finest acoustic grand and baby grand pianos, Yamaha creates digital instruments that stand above the competition. The stereo-sampled grand piano is lifelike and rich, and it's reproduced beautifully on the YPG-535's built-in stereo two-way speaker system. To add to the authentic piano experience, the YPG's 88-key Graded Soft Touch keyboard recreates the action of real piano keys in a lightweight, portable package. Plug a Yamaha FC4 sustain pedal in for dynamic damper effects, and you've got complete and authentic control over your music. Making use of the YPG-535's large, highly visible LCD screen and three lesson modes, the Yamaha Education Suite, or Y.E.S., presents an easy-to-understand and effective learning system. Choose one of the YPG-535's 30 internal songs and the notes are presented on a keyboard and music staff right in front of you. Next, choose one of the lesson modes: "Wait Mode" stops song playback until you play the correct note; "Your Tempo Mode" slows playback down when you play incorrect notes, so you can learn at your own pace, but start to get a feel for rhythm; "Minus One Mode" plays a song with one part removed, so that you can play along with the other elements of the music -- think of it like piano karaoke, except you choose what part to play. These three modes follow a natural progression, each building on an ability mastered in the previous mode, and each lesson has seven levels of increasing difficulty to push those abilities even further. An automatic grading function provides you with honest feedback on your playing. There's even a chord dictionary for familiarizing yourself with common chordal voicings and intervals, with each chord being displayed in name and as notes on the LCD musical staff. Even if you're planning on eventually studying with a teacher, the Y.E.S. will give you a head start. The ability to sight-read notation will have you understanding music in a different way, so it'll only be a matter of time before you'll want to start writing your own. For the budding Bachs, Beethovens, or Sufjans out there, the YPG-535 has a six-track sequencer built right in. Record a chord progression, then layer melody, countermelody, harmony, or whatever you like on top. Experiment with combining different instruments in one song -- the YPG-535 has 500 beautiful sounds to select from, including organs, woodwinds, strings and even drums and guitars. Save your favorite work by uploading to your computer, or use the YPG-535's USB storage device port to connect an external hard disk or thumb drive. With on-screen notation display, interactive lessons, and the sound of a real acoustic piano, the Yamaha YPG-535 is a wonderful introduction to the piano. The inviting feel, the ease of use, and the beautiful grand piano sounds will make learning a joy, while the integrated recorder will have you well on your way to becoming the next world-famous composer. Music lessons and a fine instrument are two of the best investments you'll ever make, and both can be found in one keyboard: the Yamaha YPG-535. - Dimensions (WxDxH): 53.6 x 16.8 x 5.8 in. The Yamaha YPG-535 88 Key Portable Keyboard gives to the sound and feel of a grand piano in a portable package at an affordable price. The YPG-535 offers a graded soft touch action that everyone from the beginner to the professional will love. 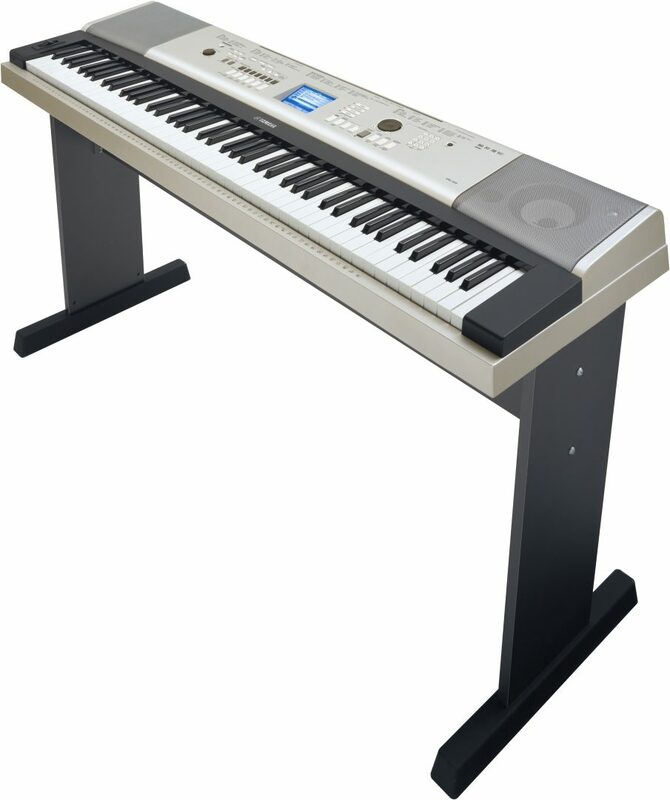 The YPG-535 also includes a stand along with a sustain pedal and power adapter. For the beginner, the built-in interactive lessons provide a user definable tempo that allow for learning at your pace. 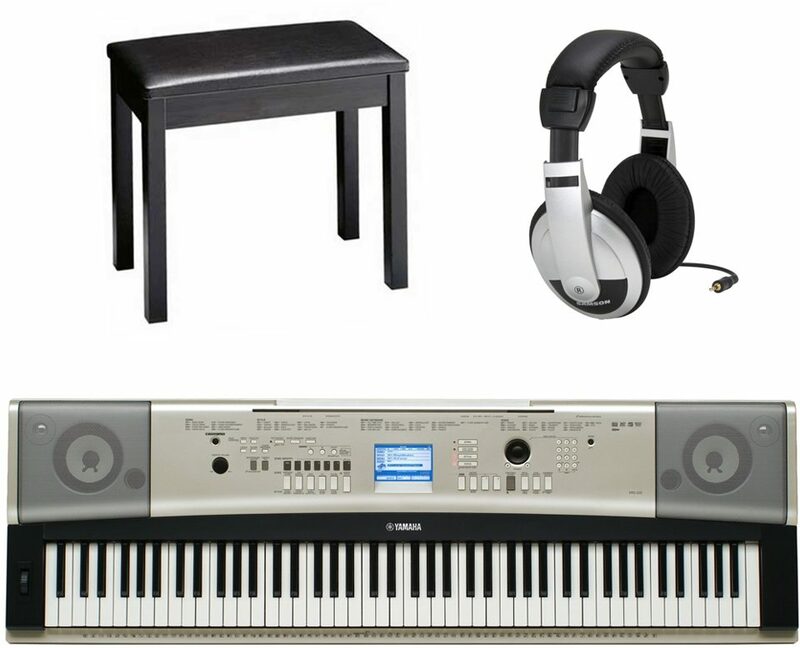 Includes a Yamaha Watch & Learn DVD, 3-Year Extended Warranty, stereo headphones, Grand Piano felt key cover, and Hundreds of dollars of Rebate Coupons. This review has been selected by our experts as particularly helpful. "All Aboard!" Sound: The Live! Grand Piano is about as realistic a sound as you can get. The panel sustain and the sustain pedal are two distinct, yet practical effects. Though there are nearly Five hundred other great voices, personally I am in love with the Sweet! Soprano saxophone.. Looks like Kenny G is out of a job. It has instruments that I had never heard of, never thought existed, and never thought that anyone would actually be able to play. Awesome. Feature: So.. I actually have the YPG525.. which is virtually the same thing.. so.. The survival kit is extremely useful. Sustain pedal = rad. There's also a cloth to place over your keys when you're not face-melting (and when you are face-melting, it can be used a cape..(yes, like a super hero)). Pitch Bender with adjustable range for all you techno freaks out there. I would suggest buying a USB Flash Drive for it if you intend to record on the User Song feature. Though each song has 5 tracks (and an accompaniment track which is virtually useless because the styles and easy song arranger sound so generic), With only 5 songs, space fills up quickly for the creative soul. The Effect Banks can be invaluable if you are playing a song with multiple instruments involved. Built-in metronome (of course). The only thing I really wish that it could do would be to change time signatures in a recording without having to go to another track. The hammerlock keys provide a good transition for anyone preparing to move from the traditional button-push keyboard to the full on Grand Piano. Ease of Use: I've had two keyboards before this one, and I must admit that this is definitely the best yet. Although I knew the basic principles of User Song recording before, I'm sure with a little time in the manual, one could easily learn how to successfully use the instrument. I still haven't been able to download music from the net due to the fact that you have to pay for it (of course). Quality: It looks very state of the art. Dust doesn't even gather well on it. It's quite a large board with 88 keys and due to that, I have banged it on walls and door frames lugging it around, but it just keeps on trucking. I wouldn't be surprised if I dropped it and it still worked. Value: I'll say that it's definitely worth the buy. Manufacturer Support: I had no need for support, but Yamaha sent a DVD detailing all of the aspects of the keyboard anyway! How's that for support? The Wow Factor: It does look pretty awesome. In a dark room with just the blue screen lit up. pretty inspirational. I also like the clicking wheel on the right... I don't know why. I just do. Overall: I've been quite thoroughly satisfied with this board. I would be pretty much lost without it. If you've been playing for a while and are looking to step up your game a bit, but you don't have the type of budget that allows you to buy a $1500 keyboard, then this is definitely for you. Intermediate players are probably best fit for this board, though anyone can use it. Wish it had more tracks, and the styles sound kind of outdated (which is to be expected when trying to define a genre in one pattern), but it makes up for those with the number of instruments, sound quality, and sheer beauty. 286 of 292 people (97.95%) found this review helpful. Did you? "Yamaha YPG-535 Portable Grand Keyboard"
Overall: the sound is amazing! the best is of course is the LIVE! grand piano sound. lots of voices including the XGlite voices, and for the price its worth it. A lot of people complain about the keys not weighted it specifically says they're not weighted its great for some starting or professional.